Here’s a reminder of why it’s so important to read your bills carefully. Lauraine Hollyer is a long-time Verizon customer. When her children were in middle school, the family decided to add a second landline to the home. It was in the early 1990s — a time before cell phones were so common. By the time her son went to college in 1999, he had a cell phone. When her daughter went to college in 2001, she had a cell phone, too. So the family decided to cancel the extra landline to the home. Hollyer said her records don’t go that far back, so she’s not sure if the line was cancelled in 1999 or 2001, but she said it was definitely around that time. She said her bills, which date back to 2009, show a long period of no billing for that cancelled phone line. As the years passed, Hollyer didn’t pay much attention to her Verizon bills, she admitted. But then she looked closely. 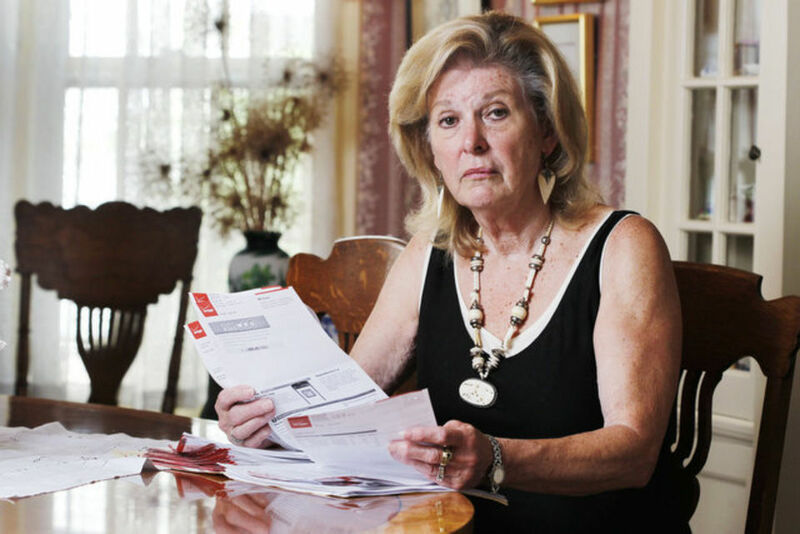 Lauraine Hollyer looks through years of Verizon bills. what this charge was about. She said checked all her bills back to December 2009, and she believed she had been paying for the previously cancelled line from April 2010 — when Verizon changed the format of its bills — until today. The monthly charges varied slightly, but the five years of charges added up to $1,500.28. Hollyer said she called Verizon with her first complaint on June 2. The rep put through an order to stop charging for the nonexistent line, and she said she could only authorize a refund worth three months of the charges. The rep offered to have a supervisor call Hollyer. Hollyer agreed, explaining that she had a work schedule that often made it difficult to come to the phone. So she said she gave the rep a list of times she’d be available for the next several days, and the rep promised Hollyer would get a call. By June 11, there was no call. But Hollyer had received another bill, and the cost for the phantom line was still there. So on that day, Hollyer said, she called Verizon again. The new rep said the bill must have been issued before the charges for that old line could be removed, and like the first rep, she said she could only authorize a three-month refund. The rep offered to have a manager call, so Hollyer again gave a list of her available times for several days. No call came, she said. She decided to file suit in small claims court, but learned she needed to switch to a different county for the filing. She said she sent copies of the suit and a letter to Verizon’s chief financial officer, but no one responded. When Hollyer’s June bill arrived, she said the line was removed, but there were still charges for the line for April and May, listed as overdue. Then she received a separate letter threatening suspension of service if she didn’t pay those charges. She talked again to Verizon, and she received a credit for those two new months of charges for the phantom line. But still, the rep could only offer three months of credit for the years Hollyer paid for the second line. “My husband and I have been loyal Verizon customers. I can’t imagine that anyone would think that an offer of $76 for a $1,500 overcharge would be considered anywhere near fair or reasonable,” Hollyer said, and she reached out to Bamboozled. Hollyer admits she should have been more vigilant in reading the bills. “However, I have a right to expect that when a bill is submitted it is correct and that charges for something that has not been charged for over nine years won’t all of a sudden magically show up,” she said. We reached out to Tom Maguire, Verizon’s senior vice president for national operations support. He’s helped out Bamboozled readers before. Maguire and his team researched Hollyer’s account, and in less than a day, he had a solution. “I went back and checked our network to see if there was activity on the line in question, and I found there was no activity,” Maguire said. For that reason, he said he will refund the $1,500. Maguire said the company was unable to determine when the cancellation request for that line came in. He also said it’s unacceptable that she didn’t get the calls back that she was promised, and that Verizon would be talking to the people who didn’t follow through. Hollyer confirmed that she got a call from Maguire, who she said apologized for the lack of calls back and offered the $1,500. Hollyer said she was glad to be getting the credit, but she was still a bit bitter about her experience. While Verizon is giving Hollyer a refund, we want to be clear about a few things. As a customer, you do have the right to expect accurate bills. You also have the responsibility to read your bills carefully and question any errors in a timely manner. To ask Verizon, or any company, to go back though 15 years of records is a pretty hefty request. While certain records are probably available, in most cases and with today’s technology, it’s likely that internal recordkeeping systems have been updated. That may make it near impossible for any company to see records of phone conversations and other communications going back that far. That’s why you, as a consumer, need to hold onto copies of anything and everything that could pertain to a request. Bills. Phone logs. Paper and email correspondence. Screen shots of online transactions, online chats and text conversations. Keep notes on what you requested and when, what was promised and who you talked to. And follow up. Read those bills carefully and make sure the company follows through. Then keep those records so you have proof should something unexpected happen. Sure, no one expects to need something like that 15 years later, but you never know. If you want to prove a case, you need to keep the evidence. One more thing: there’s no excuse for a company to promise to call a customer back and not do it. Nor is there any excuse for not responding to letters or emails. So Verizon took a look back. Records show two calls were made to Hollyer’s home phone, and the rep’s entries say voice mail messages were left. When Verizon was unable to contact Hollyer, it sent a letter dated July 22 to her home, asking her to call a specific person at the Verizon executive relations team. Hollyer said she never received the messages or the letter. We’re guessing if she had, that probably would have lessened her feeling that her requests to move up the Verizon food chain were being ignored. Sometimes things do fall between the cracks — on both sides of a dispute. The lesson? In the end, keep those records to protect yourself. Period.